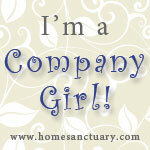 I am having one of those housework ADD days... um, make it week! Trying hard to catch-up on everything plus kids underfoot and talking non-stop makes for bad headaches. At least today is Wednesday. And time for new grocery deals! Winn-Dixie Ad. Thanks to Southern Savers for match-ups! *I do hope our store has this $1/2 Tearpad! Publix Ad. Thanks to I Heart Publix for match-ups! Last week was a fun one for me at Publix. Except for the Shout and Windex getting wiped out at both 9th Ave and Mobile Hwy stores. I'm not sad because they're BOGO again this week! Food World Ad. They are having Crazy 8 Sale and don't forget up to $0.50 double coupons! Barnes. Last week was not good at all. I was going to buy the paper just to get the Barnes Ad but there was nothing worth reporting that I didn't buy it and saved myself the $0.75! It's Saturday and time to get ready for our CVS, Walgreens and Target shopping. New ads come out tomorrow but the deals are drawn up Friday or Saturday by eager-beaver bloggers everywhere. CVS Ad Scans from IHeartCVS and Match-Ups from Coupon Saving Game. *Also, submit for Method Laundry money-back challenge. Then, submit for a FREE Movie Ticket! Walgreens Ad Scans from IHeartWags & Match-Ups from Coupon Saving Game. Target Gift Card Deals and Sneak Peak Match-Ups from Totally Target. 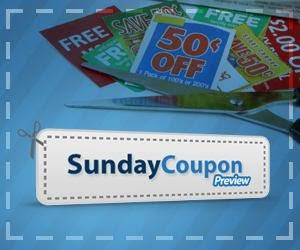 Sunday Coupon Preview has SmartSource and RedPlum inserts. 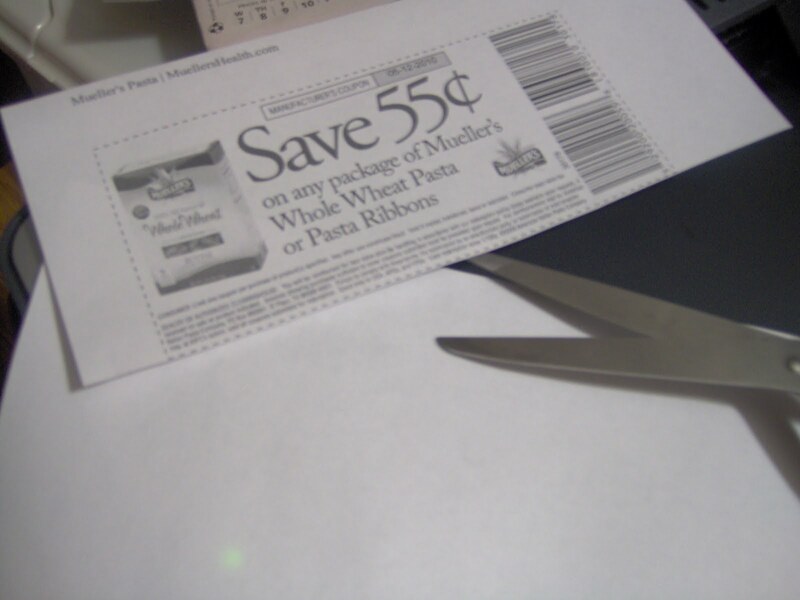 Some coupons are regional. 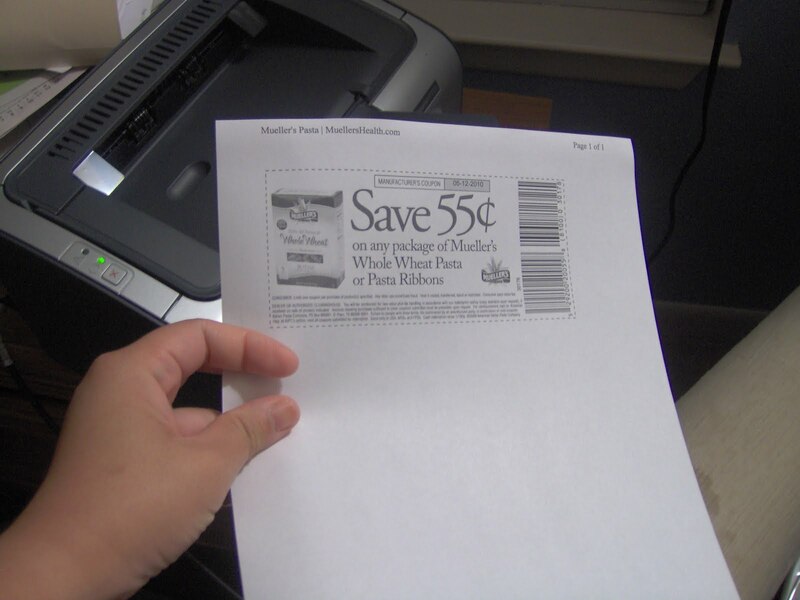 You can also print other Smart Source coupons. You can also print other RedPlum coupons. Around this time of the year in April, I attend the Women's Expo, mainly to get samples from the Apple Market. But they won't have it again until next year! To make up for it, they will host a health expo instead. And Apple Market will be there. If you have never visited this place downtown (next to the Angus Steakhouse), it's a true Pensacola Gem. At the Expo, they will have local vendors that sell products at their store. I've had the pleasure of tasting Boar's Head hot dogs and deli meats, blueberry rootbeer, Pirate's Booty snacks, Apple Market's apple dumplings and more. We didn't have to buy lunch after that because we were so full. But the Gulf Coast Health Source Expo will be more than that. 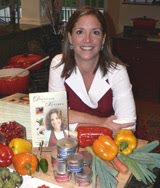 The Dietitian in the Kitchen, Diane Hendricks, will have cooking demos. Baptist will have lots of FREE Health Screenings. You could also pledge to lose weight for the Pound For Pound Challenge. How many pounds you pledge (not lose!) will be how many pounds of food donated to the Bay Area Food Bank. A donation of canned food is appreciated. Where:Pensacola Junior College Lou Ross Center, 1000 College Blvd. Read more about it from Bella Magazine's article. Life is full of surprises. Like when I uploaded these pictures I was sure they would get all jumbled up and here they are just in the order I wanted them to be. Sometimes, I sure wish ALL of life is like that. This post is linked to IHP, MSM, TTM, CSG, FF & TFF. Cryptic, I know. Seeing how other people saved sometimes brings attention to deals I've overlooked. I hope you too will be encouraged! Sunday and Weds were my shopping days, plus a small trip Thursday. 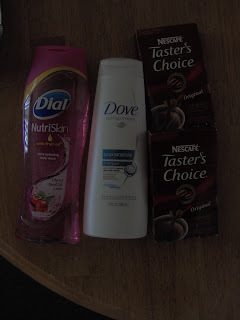 I missed out on Walgreens again this week, but we have shaving cream out the wazoo, so it's ok.
$7.22 at CVS not $39, saving 82%, plus got $10 ECBs! *You can see Sunday's shopping recap by clicking the store name. It's higher than I hoped to have but considering we stocked up on toilet paper, pasta, popcorn, bathroom cleaner, it's pretty good. The Target Gift Cards also paid for our long distance phone card which I'm not including the grocery total. 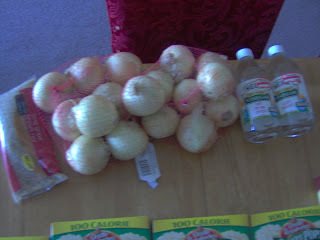 I ran in to Target to get more onions, $1.49 each and vinegar, $0.18 each after $0.50 Q and brown rice, $0.72, that's pretty cheap! 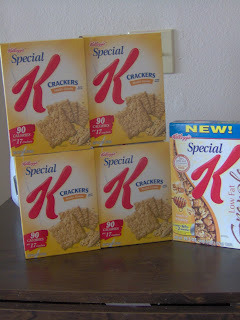 At another trip, I used $1 Special K crackers & granola cereal Qs to get these for $5.35. I got a $5 GC. Using this with another $5 GC from Sunday's Target trip, hubs bought a 600 minute ATT phone card for only $5. So that's only 1 penny per minute! 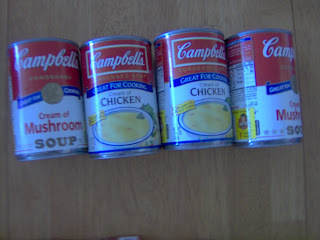 Publix has Campbell's soups for $1. BUT Wal-Mart has cream of chicken and mushroom for $0.72, so only $0.22 each after the $1/2 Campbell's Q. I got a gallon of milk too and paid $3.86 total. 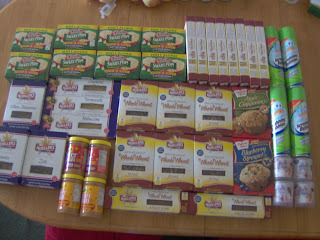 My big Publix trip below was only $7.46, although I got quite harassed by my use of coupons and buying too much pasta. Apparently, the Publix ad often states "Quantity rights reserved" for certain BOGO items. I found out that the store I visited has a limit of 4, so with BOGO, you get 8 items max. I wish they would let people know what their store limit is on the shelf tag instead of telling you at checkout, because it is quite embarrassing when the cashier yells out, "Isn't there a limit for this spaghetti." What if I was throwing a Pasta Party?I called later and spoke to the store manager, not realizing how upset I really was. Or maybe it's PMS. He assured me that the dignity of the customer is very important to him and he was sorry that I was embarrassed and will speak with the cashier. I also reminded him that this was the only Publix I frequent and I do spend a lot of money (before coupons!) at his store. In the midst of "doing our job" we all have at one time made the mistake of saying harsh words, however unintentionally. Better if she informed me discreetly of company policy. I could have reacted the same, given the ear of her store manager. But his gentle answer did help me feel vindicated. Life lessons at the checkout lane... I love it! It's Wednesday and time to roll out the new grocery deals. So far, I am not seeing much, other than Publix, which is definitely where I am headed first thing Weds! If you see something that you like to get in bulk (like 10 Mueller's spaghetti), consider placing a special order. That way the shelves don't get wiped out. I am looking into it myself. Go to customer service and place the order. You will be linked directly to the store ad by clicking on the store name. As long as the ad is not BOGO or % off sale, you may also price-match the item at Wal-Mart. Same tips basically apply at Target, except add that you must possess the grocery ad at the time you check out at Customer Service (not at the registers) for name brands only. If you need to find a coupon for an item in the ads, I recommend Hot Coupon World. Their database is fast and easy. Publix. Time to stock-up for popcorn, pasta, candles! Read on after this post or here. Bad news though, Tombstone for our area is BOGO 2/$5.49, but still an excellent deal if you have the $3 off 2 (only $0.75 a pizza is great any day). Winn-Dixie. More match-ups from Southern Savers. Food World. Double coupons up to$0.50! Greer's. This ad usually comes out mid-morning Weds. Hopefully I'll remember! When I get a copy of the newspaper, I should have the deals for Barnes. How am I going to do it? 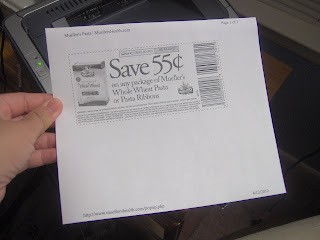 Well, thanks to I Heart Publix, here are the coupon match-ups. Pay only $0.19 for 2! Pay $0 + $0.25 overage! If the store has these Qs then, use 2 $1 Qs, pay $0.90 each! Pay $0 for 2 candles! Pay $0.29 for 2 or only $0.15 each! Third, print another with the smaller paper. Don't cut it off yet! 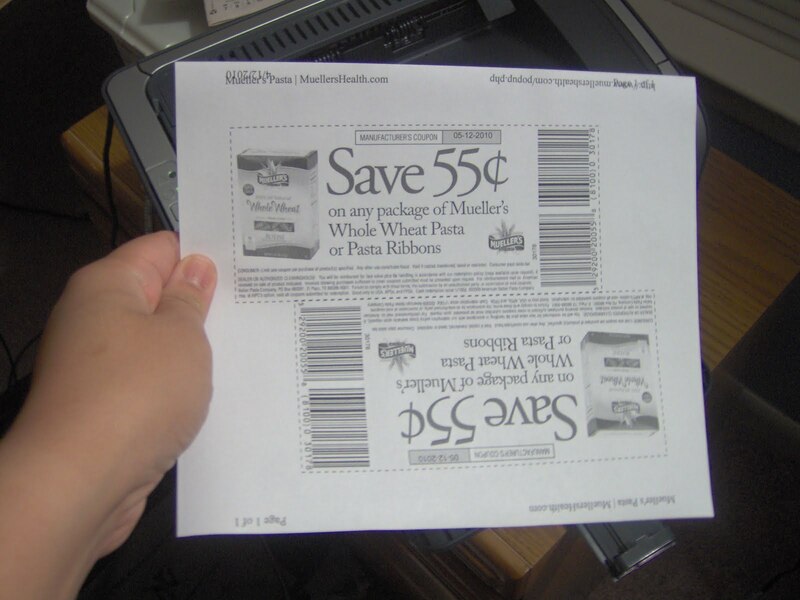 Then rotate the paper so it prints on the other side of the coupons. This depends on your printer. Voila! 2 coupons fit in this smaller paper, giving you 3 total! Whew! Saving the environment takes a lot of work! Have a Thrifty Tip to share? Pass it on! I have never seen these kinds of Qs before! If you are looking to get any carwork done-- be leary of PepBoys! But this coupon is great if you do work yourself and buy parts there. Also, I highly recommend Sherwin-Williams paint. We've used their paint lots of times (professional painters) and their service is better than anyone. Although the paint is more expensive, this coupon will give you almost $10 off Super Paint. Better paints means less coats which means less time painting! Maybe in the future I could do a whole post about painting tips. I could really ramble on, I love painting! Since Publix has strawberries on sale for $1.25, we have lots of them on hand. 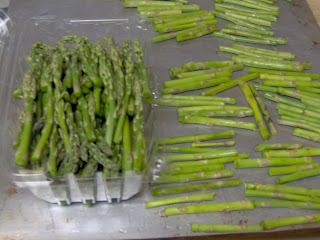 As I cleaned them today, I thought it would be great to use them for storing other produce. And it worked beautifully. Now, the fridge doesn't have to be littered with those thin produce bags! 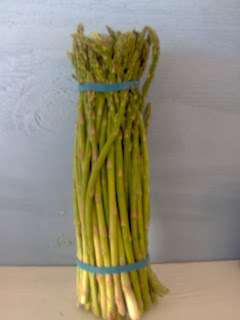 Asparagus are $1.99/lb at Publix. Lay it on it's side on a cutting board, keep the rubber bands on, and cut off the ends and portion sizes. Same with parsley and cilantro, I keep the ends for making broth. 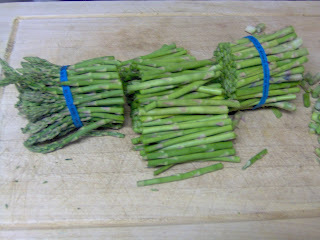 The top and middle portions I'll store in the fridge and cook this week. The bottom pieces will be flash frozen for later. A friend assured me these freeze fine. 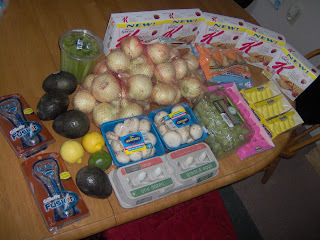 This post is linked to Thrifty Tip Tuesday and Frugal Friday, whenever these posts go up this week! This week's sales are good through Tuesday. And you can see what else is on sale at area stores in this Grocery Deals post. I've had Publix on my mind all week but couldn't get there until tonight. 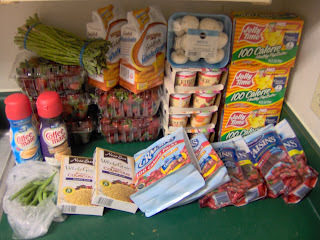 Everything pictured was only $18.15 + 0 tax. Because no food tax is one of the few good things about living in FL. Also, don't forget to ask for the coupon booklets at Customer Service, especially at Mobile Hwy. They have a new yellow and green Advantage Ad and also One Stop One Store, There's Value in Family, and Personal Concierge. View coupon lists at I Heart Publix. 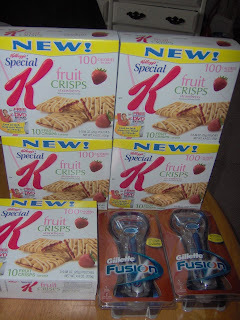 *They are out of the graham cracker version, so I might price match these at Wal-Mart tomorrow or just get a raincheck at Publix. I hope this gave you a glimpse of how my brain processes bargain shopping. Yes, I often think in exclamation points! Anybody a fan of Kung Fu Panda? You'd understand if I said I have had the noodle dream, only it was about coupons. On more than one occasion. UPDATE: Just got my Charmin tonight. And found Reinventing Beauty coupons by the registers! Grab them by the before they run out. *Check out this video we made this morning at CVS! It's amateur and dorky, I know! At the end it cut off. All I was trying to say was that you can use 2 coupons for a BOGO deal. As time permits (aka when my kids are behaving and I am not feeling lazy), I'll have more videos like this for you. This is especially for my friends who are visual learners. This morning at CVS I found lots of Dove hair care products for most any hair types, so come in and get your FREE Dove product! For the Dial Nurtiskin bodywash, only 2 scents are available. 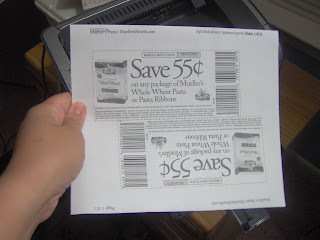 Find the coupon links in my other post. VocalPoint Members, look out for the Puffs sample in the mail. I just got mine and found $1 and 5 $0.50 Qs, good for the P&G Deal. Paid $7.22 +$1.82 tax, Got $10 ECBs back! Yes, I'm a toilet paper snob! 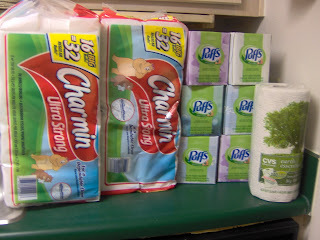 I have been addicted to Charmin since my college days. But to my defense, we have used up our FREE Marcal toilet paper until a few days ago when that ran out. God be with us, Charmin was finally on sale! Both at CVS & Winn-Dixie (through Tuesday, get $5off wyb $20 PG). We treat Charmin like gold at our house. Even our 5 year old knows the 3-square rule! I spent $30 & got $5 Gift Card for everything. Last time they had the Special K Fruit Crisps $5 GC promo, our store ran out & didn't restock in time. So I still had my coupons and was finally able to use them today. Patience and perseverance, ladies! Also 75% off Blue Dot items at the Dollar Spot! 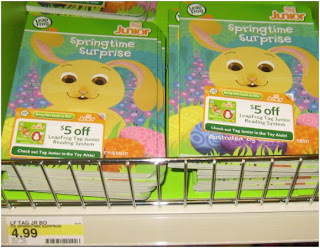 90% off this Tag Junior book- now only $0.50! Photo from Totally Target. Last week, we tried to make a short video at Target. We couldn't figure out how to upload it onto YouTube. Then I checked today to find it magically fixed! Here is my first vlog! 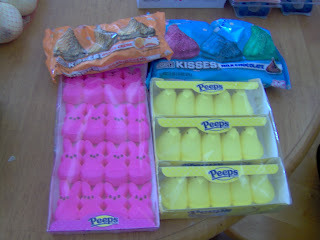 Of course, now, these deals are mostly gone but better at 90% for Easter, 75% for candy. Even the Heinz 57 is now only $0.68, minus $0.50 Q will only be $0.18! How are you all doing? I've been sleep deprived and running around like a chicken with its head cut-off. But we are getting more homeschooling done these days, that's a plus. That meant I haven't had time to get on this blog! I am trying with the help of my very sweet husband to figure out YouTube so I can upload some bargain hunting videos to share with you soon! CVS Ad Scans from IHeartCVS and Match-Ups from Hip2Save. Get $4.99 ECB = FREE! Pay $4.49, Get $4.50 ECBs = $0.09! Pay $24.97 Get $10 ECBs! Buy 2, Use BOGO Q + $0.75 Q, Pay $0.25 for both! Use the same login for Coffeemate's website. *Don't forget to scan you CVS card in the price scanner for store coupons. 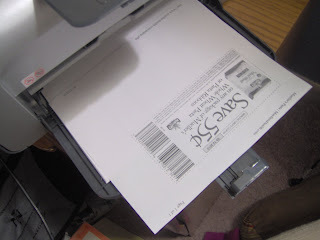 The quarterly CVS Bucks also started printing April 1 so check for extra CVS money! I should only spend $12 and get $10 ECBs to rollover next week! UPDATE: It looks like we can't use the $5 off 2 Tylenol, etc. because the coupon is ringing up like a RR. So the machine thinks that you've already used an RR. And depending on your manager, my experience is that they don't just give you the value of the RR in cash! I'm glad I didn't end up going there today. Maybe they'll sort out this problem in the next few days. Walgreens Ad Scans from IHeartWags & Match-Ups from Hip2Save. Pay $3, Get $3RR =FREE! Pay $4.98, Get $5 RR =FREE! Total I would spend is $5.50, buy I'd get $5 RR for next week! Target Gift Card Deals and Match-Ups from Totally Target. *I would do these in a separate transaction. Sometimes, when I've used coupons for gift card deals, the look like they went through but somehow get deducted from the total. Target receipts are a pain so you reallly have to pay close attention. Pay $6.95, Get $5 GC = only $0.39 each! $0.75 off Silk Soymilk and BOGO Ziploc Slider Bags. From Red Plum: $1.25 any Vaseline and $3.75 off Vaseline Sheer Infusion, $5 off 2 Benadryl, Tylenol, etc. Welcome to Wednesday! New grocery ads are up, but it's looking like a doozy so far, when it comes to meats and veggies. But if you are in the market for Juicy Juice, milk and Goldfish, you are set this week! Buy 2 of each listed, pay only $1.80 for 8 items! Using coupons really works. Still waiting for the site to update their grocery ads.